I wrote an article about recommendation functions of SNS, from the corporate point of view. This is a bold title, but I ended up writing about how stealth marketing will dissolve, and information will be just information for consumers. This is a 12-time serial about types of strategic public relations. I interviewed a design company in Kyoto, Squeeze Inc.’s, Mki Terada. I was interviewed about Generation Y, the generation after Generation X.
I was interviewed by 4 university students. 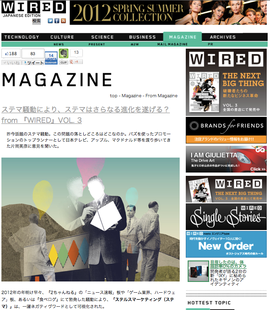 I was interviewed about “communication” work. 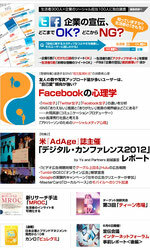 I was interviewed about the campaign blog of “Pitamac”, McDonald’s new product. 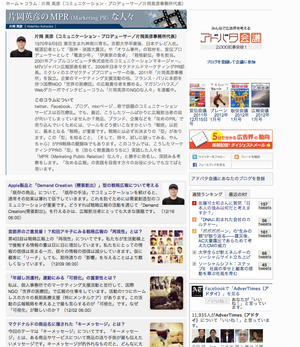 I was interviewed about McDonald’s Japan’s “Pitamac Car Blog Campaign”, a campaign using a blog. Copyright © 2010-2016 株式会社東京片岡英彦事務所 All Rights Reserved.